With this 40 page guide, newly updated in 2018, anyone with basic experience in group facilitation can lead a conflict styles workshop, yet even veteran trainers will find new ideas here. Step-by-step outline with many samples of suggested trainer inputs makes workshop preparation a breeze. Includes training exercises, suggestions for opening and closing, a section on culture and conflict, discussion questions, and a roleplay. The guide is keyed to our Style Matters inventory, but most of the content applies to any inventory based on the Mouton Blake Grid, including the Thomas Kilmann. Includes sections on leading workshops face-to-face or online. 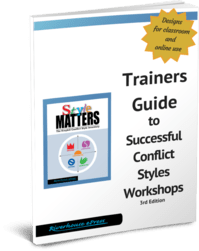 Also, don't miss this addendum to the Trainers Guide, outlining a workshop for users of the online version of Style Matters. This is a concise, high-quality trainers' guide based on decades of experience by a renowned expert in conflict resolution training. We give it away rather than sell it, in the hope that everyone who trains with Style Matters will download and read it. Participants deserve high quality training! Since Style Matters and the Thomas Kilmann are both based on the Mouton Blake Grid, many aspects of this guide are relevant to the Thomas Kilmann as well. For a point-by-point comparison of Style Matters and the Thomas Kilmann, see this detailed comparison chart.